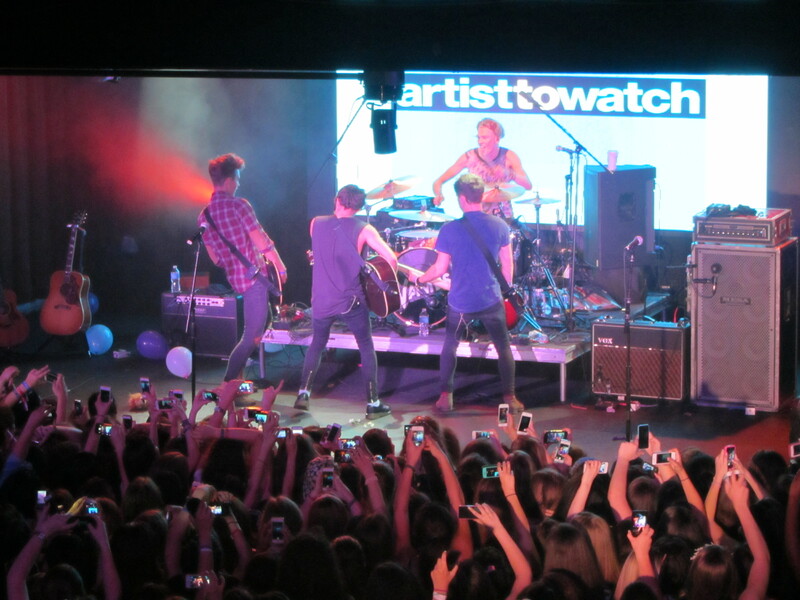 MTV Artist to Watch: The Vamps at Highline Ballroom in NYC! 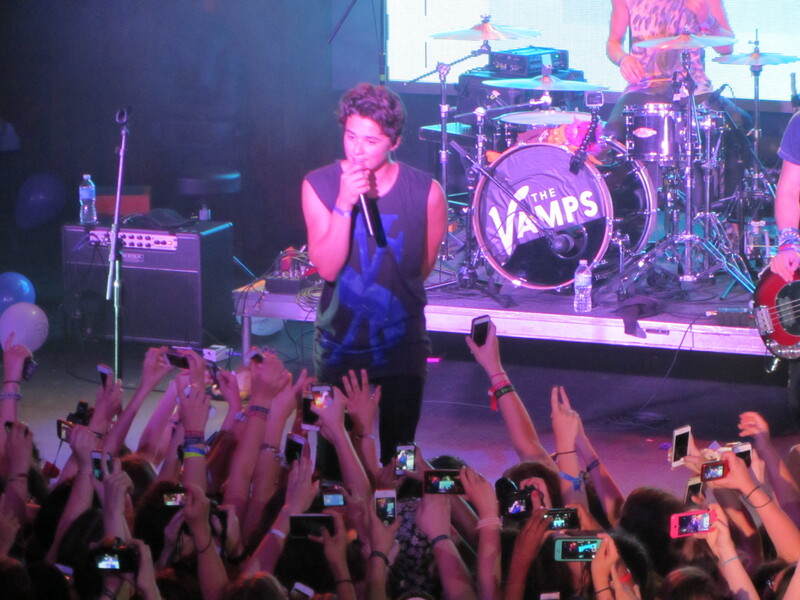 British band The Vamps (yes band, NOT a boy band) played to a sold out crowd at NYC’s Highline Ballroom on Sunday. The show was part of the MTV Artist to Watch Series, which has recently featured artists such as Austin Mahone and Hunter Hayes. We were thrilled to have the chance to see them again! This wasn’t their first time playing in NYC: Back in February, they played the Gramercy Theatre with AJR. Since then, The Vamps released their debut album “Meet The Vamps,” which has been as high as #2 on the charts in the UK, and have been all over the world in support of their album. The quartet, Bradley Simpson (lead vocals, guitar), James McVey (lead guitar), Connor Ball (bass) and Tristan Evans (drums) really mesh well together considering they found each other via social media about 3 years ago! Each member has their own unique style and musical taste (James for example is a fan of country stars like Dan + Shay), yet the music The Vamps create is pure, catchy pop rock at its best. The band’s musicianship, harmonies, and talent show that this group is more than just another band creating a frenzy among teenage girls. Their high energy performance had the crowd dancing from start to finish! The Vamps’ set featured all of their singles, including the latest “Somebody To You,” and the first song the band ever wrote together, “She Was The One.” The crowd was singing along to every word, which is impressive for a band whose album hasn’t even been released in the US yet! They have a great stage presence, interacting with each other and also with the lucky fans in the front row! 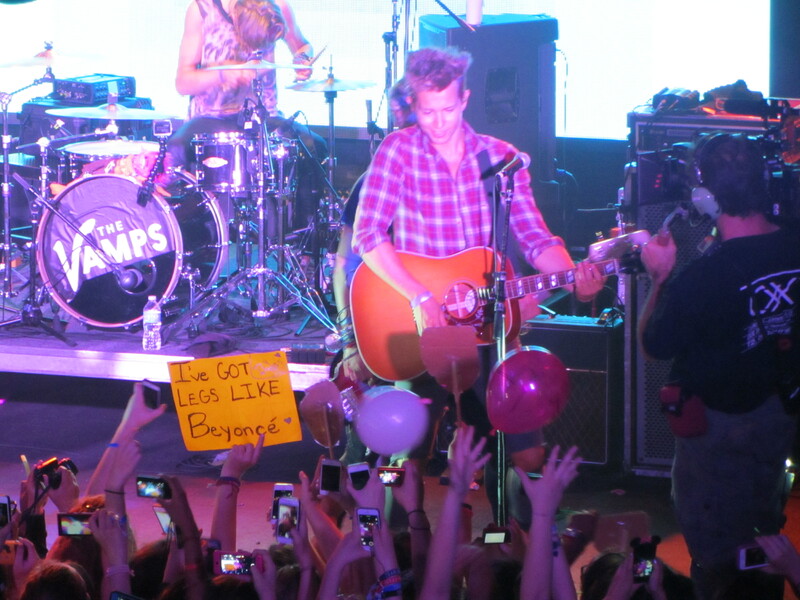 The Vamps also performed solid covers of The Killers’ “Mr. Brightside,” Simon and Garfunkel’s “Cecilia,” and a fun, rock version of Jason Derulo’s “Trumpet.” When the crowd started chanting “take it off,” Tristan turned it into a jam session showcasing all of their musical talents, as Brad told the audience “let’s make some music together!” If you haven’t met The Vamps yet, get ready: they are most definitely the Artist to Watch in 2014! Watch our video of The Vamps performing “Somebody To You” and check out our Youtube & Tumblr for more photos & video from the show! If you’re in NYC, you can meet The Vamps and catch an acoustic set at Planet Hollywood tonight! If not, be sure to tune into their livestream at 6PM today…they’ll be making a big announcement you don’t want to miss! The Vamps will be touring the US with Austin Mahone all summer long! Check out the dates here and get a copy of “Wild Heart” on iTunes! Be sure to follow The Vamps & The Secret Fangirls on Twitter for more updates! Previous PostAustin Mahone Adds New Summer Tour Dates!Next PostJesse McCartney Announces In Technicolor Tour!